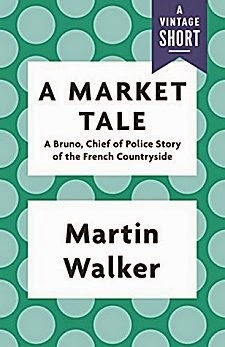 First Line: Like so many events in the small Périgord town of St. Denis, deep in the gastronomic heartland of France, this story begins in the market that takes place each week in the square between the seventeenth-century mairie and the old stone bridge that crosses the River Vézère. Martin Walker's Bruno Chief of Police mystery series is one that I just can't get enough of, and although I wish he would write them faster, there's nothing I can do about it. What better way to get a Bruno fix than to savor this little digital short story? "A Market Tale" centers on the weekly market in St. Denis. If you're hungry before you start reading this story, be warned: once Walker begins describing all the food and drink to be found in the market, you'll have to stop reading and find something to eat as quickly as you can. There are two things I adore (yes, you heard me correctly-- adore!) about this series. One is Walker's loving depiction of the life, the culture, and the food of a small town in southwestern France, and you find that here in abundance. The second thing I adore is the character of Bruno. In all of crime fiction, I do not think there is another police officer as intuitive, as observant of human nature, as Bruno. His skills are put to the test in this story as he comes to the rescue of true love-- Marcel and Kati-- by fighting a wicked witch-- Marcel's sister Nadette. If, like me, you've fallen under the spell of this series, you must savor this story. If you've never indulged in the decadent richness of life in St. Denis, "A Market Tale" is the perfect bite-sized sample. Bon appétit! Oh, thanks for sharing this, Cathy! I'm a Bruno fan too! It's a terrific series, and he's a good character. I must read this story. Soon. That's what I thought the second I found it, Margot. We definitely are Bruno fans!